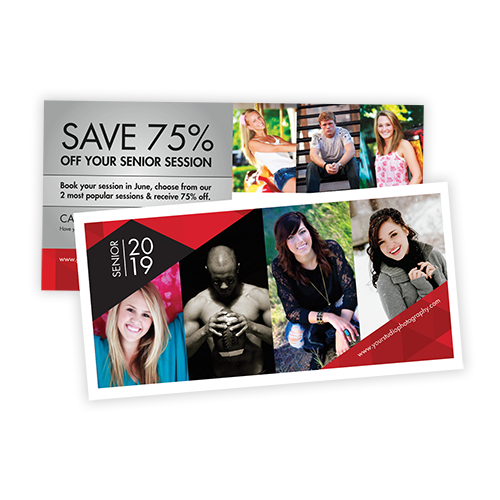 Marathon's vibrant senior marketing campaigns are designed to capture the attention of seniors - and keep it - by featuring interactive materials they can't put down! 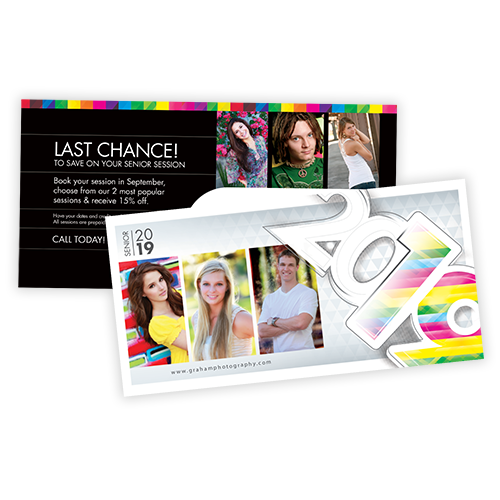 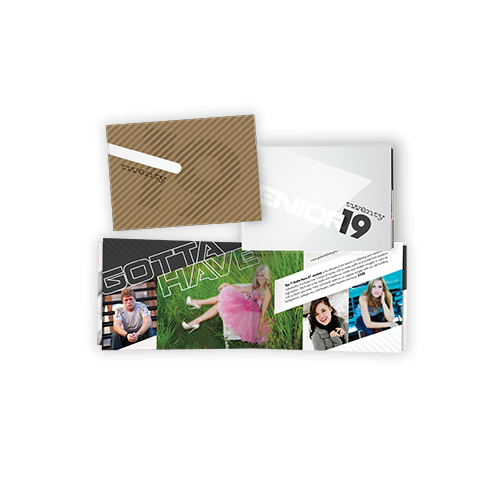 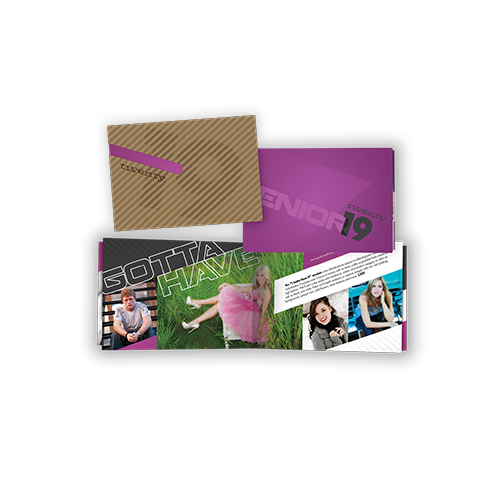 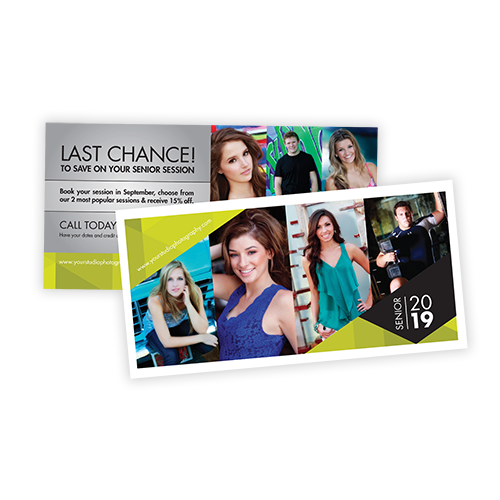 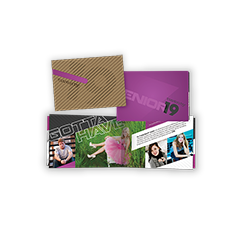 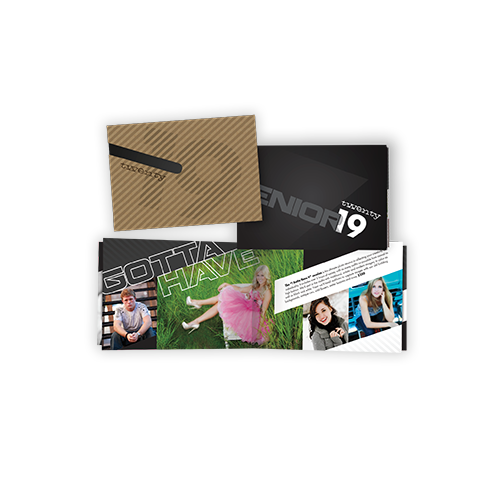 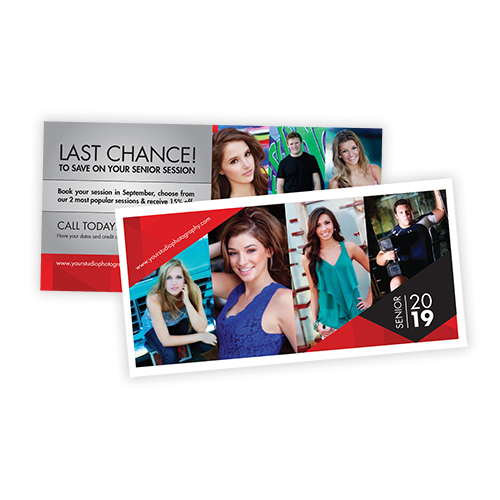 Most seniors don’t commit to a studio after receiving their first mailing, so this one is designed to accomplish the first step in the promotional process...to create AWARENESS that it’s time to think about senior portraits. It attracts attention because it focuses on a status that seniors recognize - membership in the class of 2019 - an element they will see again when they receive the heavy guns of this three-part marketing campaign. 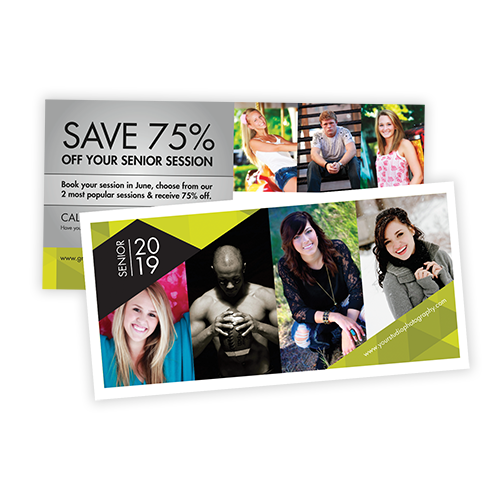 A vital link between marketing and sales is COMPREHENSION; if seniors fail to comprehend that your photography style is worthy of their consideration, they won’t give your studio a second look. It takes more than social media to draw ideal clients to your website to view your images in depth. 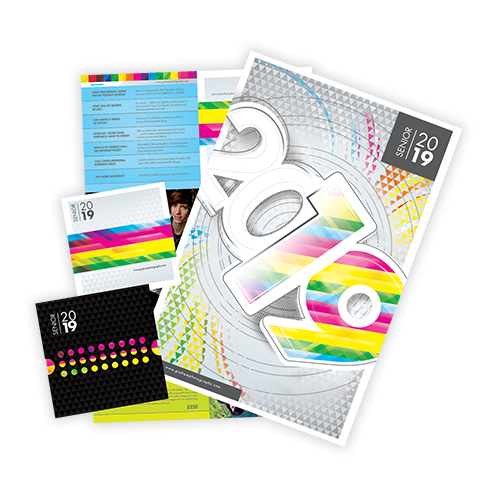 So the marketing style presented by these intriguing marketing pieces - contained in neat holders featuring die-cuts that reveal their vibrant designs - assures that our marketing message will be read and remembered! 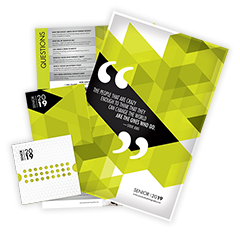 CONVICTION is what sells! 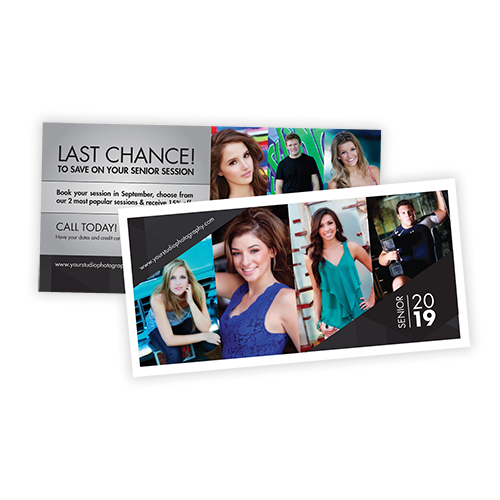 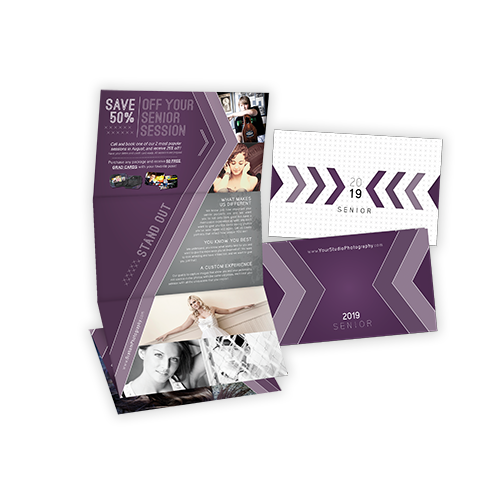 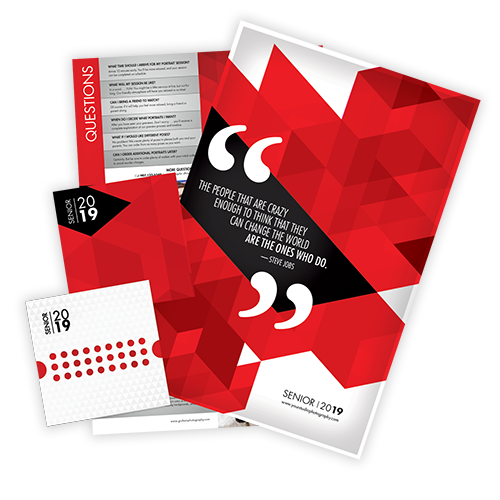 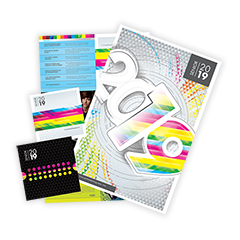 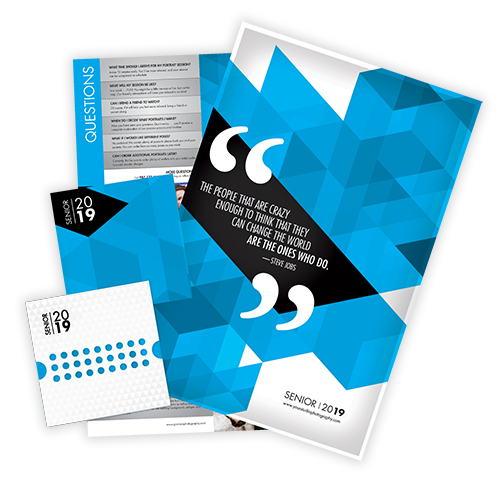 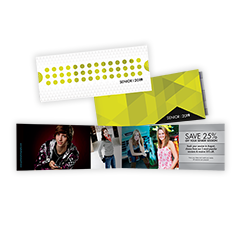 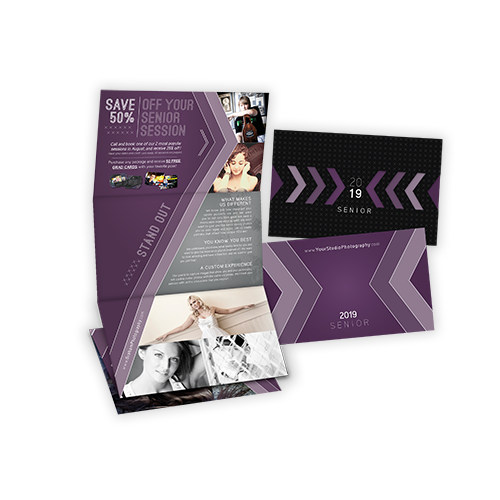 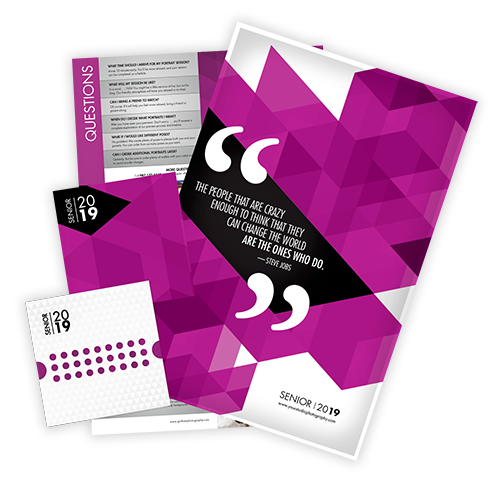 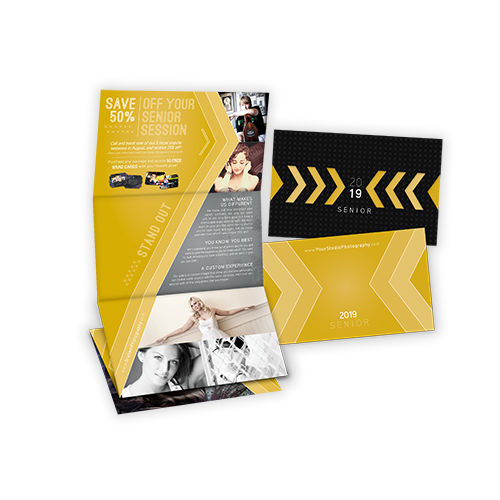 Conviction is the final step in the promotional process, and this mailing is designed to convince seniors that your studio stands out from the rest. 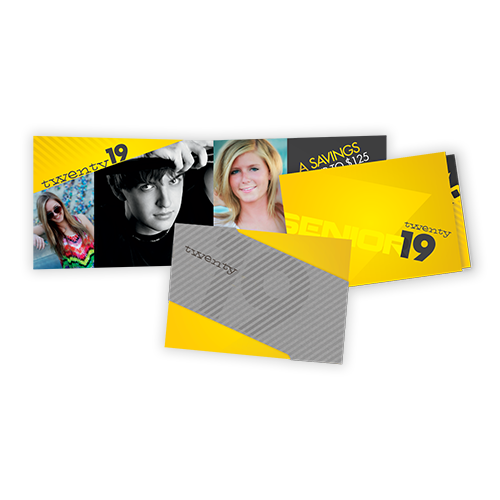 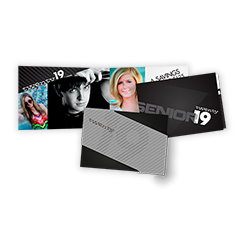 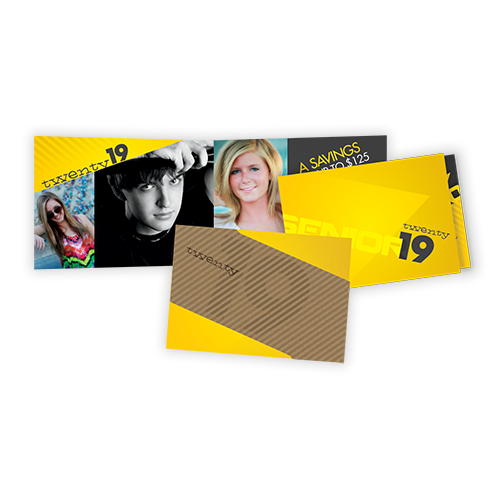 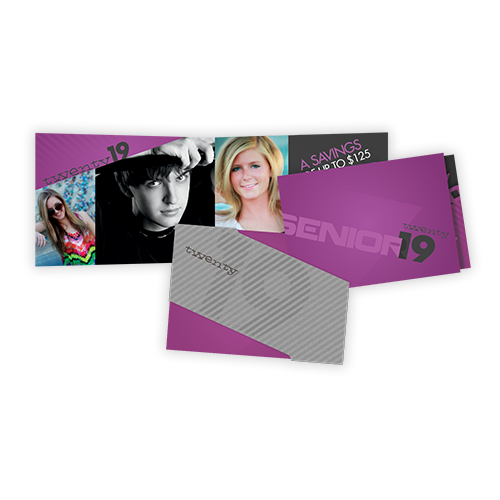 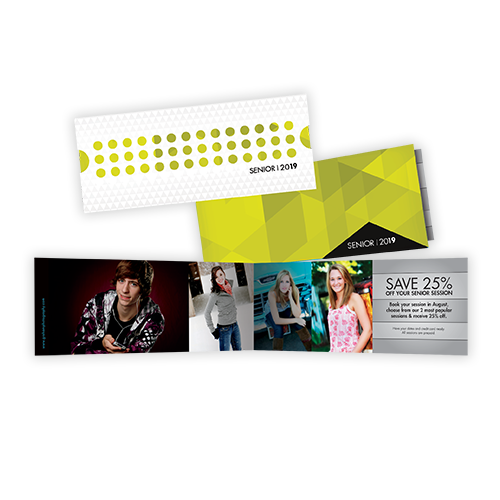 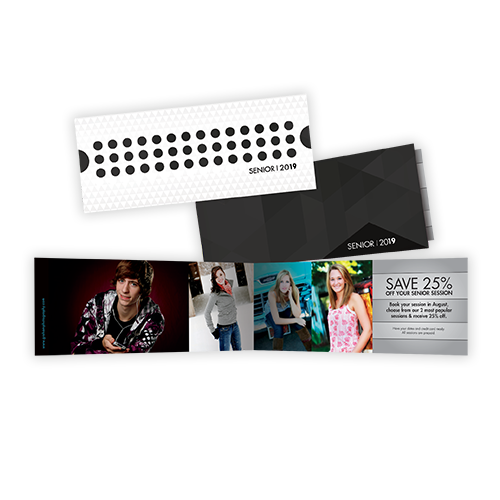 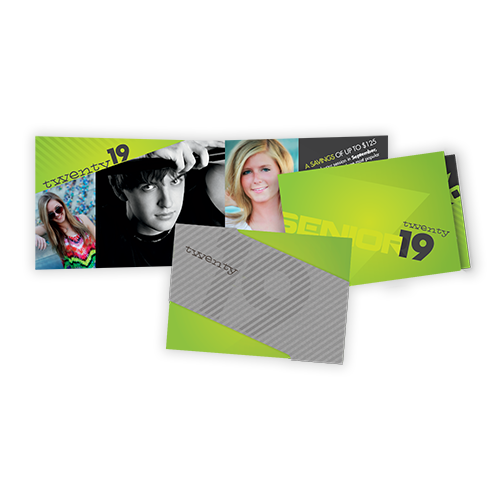 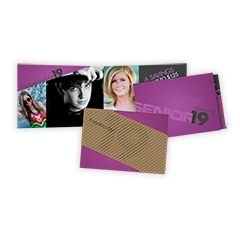 The design itself, following on the heels of the memorable second mailing, serves as a powerful reminder that your studio has the creativity they expect for their senior portrait experience. 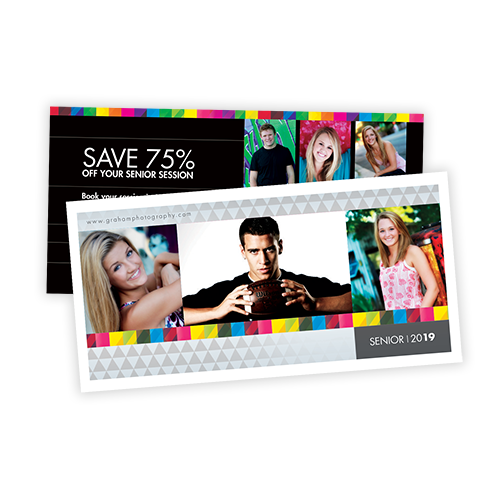 For only $.60 per name, you can add another mailing to your campaign! So consider adding a “last chance” customized post card that features the same compelling graphics of the other three mailers, which will help clarify that seniors must call NOW, or they’ll miss out. 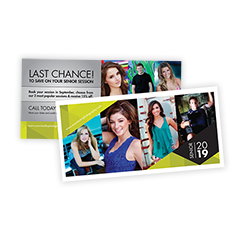 These 3-part promotions are limited to only one studio per marketing area, so call (800) 228.0629 NOW to make sure your preferred ZIP Codes are available! 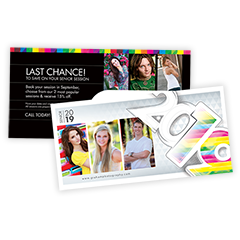 ZIP Codes are protected on a first-come, first-serve basis. 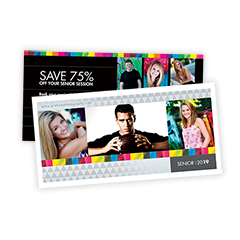 3 automated mailings with your choice of 18 mail dates between February - October 2018. 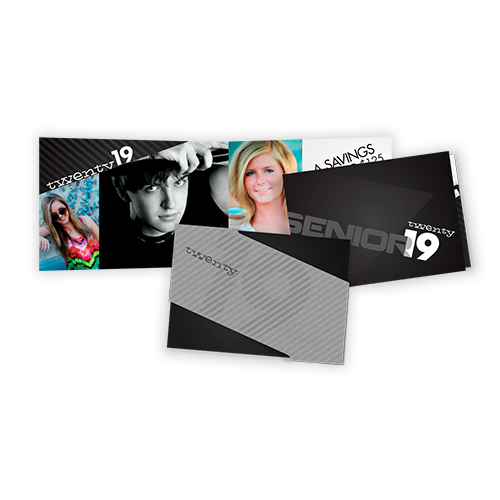 *Senior Marketing is only available for US residents. 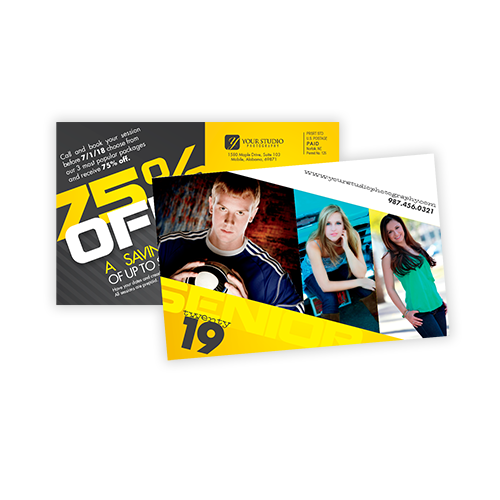 "This past year I decided to try the Senior Marketing Program from Marathon. 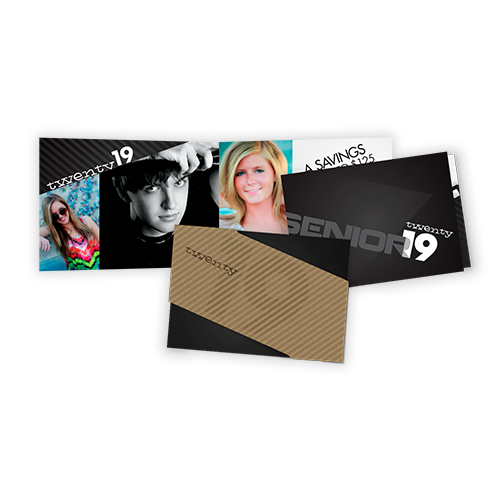 The program definitely increased my senior business! Potential clients that I would have otherwise not reached responded to the mailing and became not only clients but huge fans! 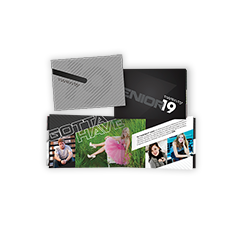 Both parents and seniors commented constantly on marketing pieces they received - how “cool” and “beautifully designed” they were and that’s what prompted them to call. 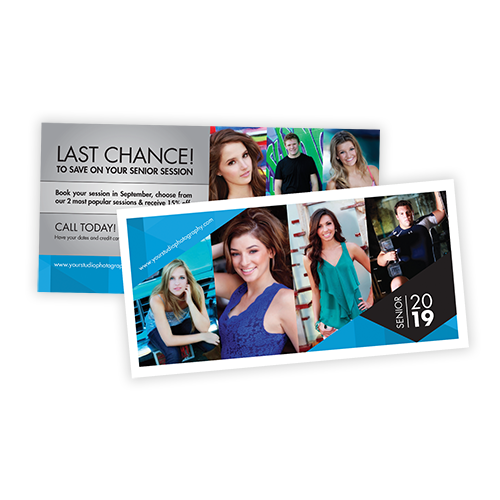 I’m definitely participating in the program again this year!" 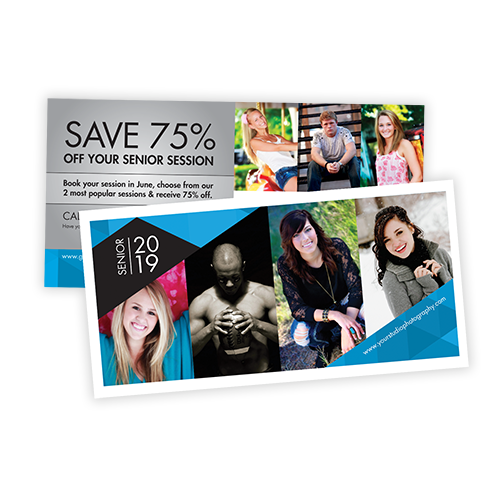 "For several years, the number of our senior sessions had been steadily decreasing. We set a goal to reach a broader base of seniors and turned to Marathon. 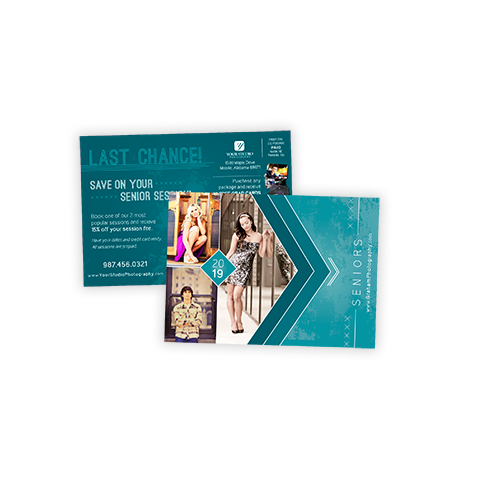 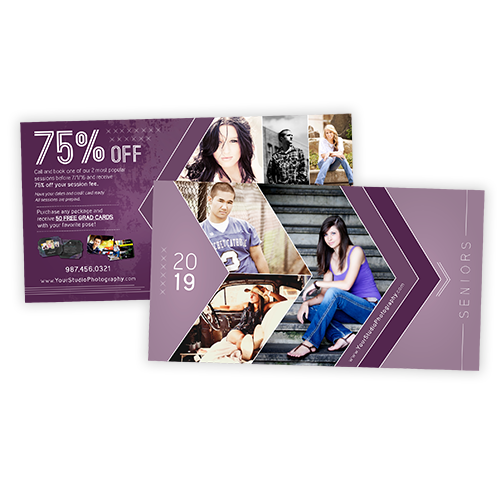 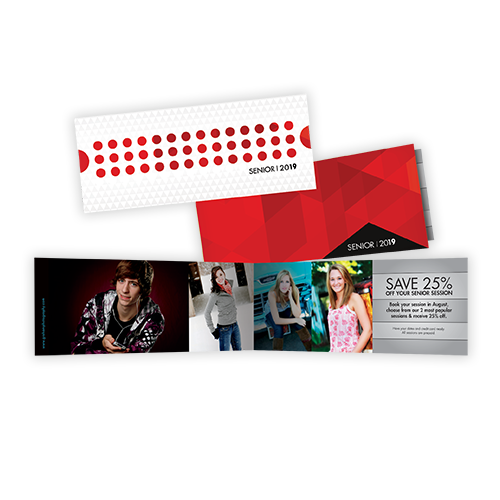 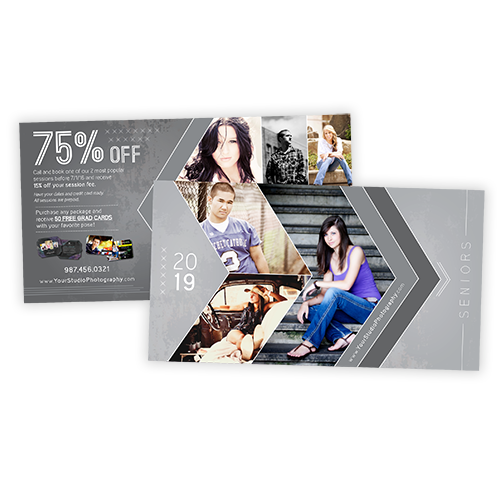 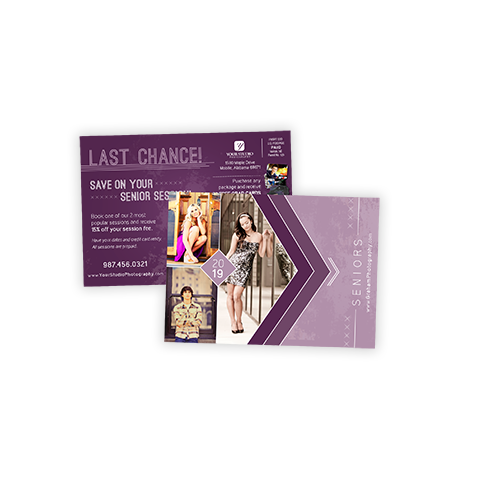 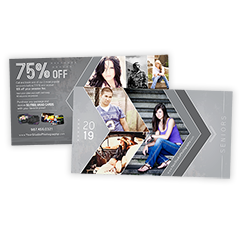 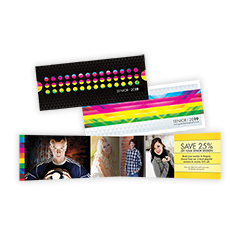 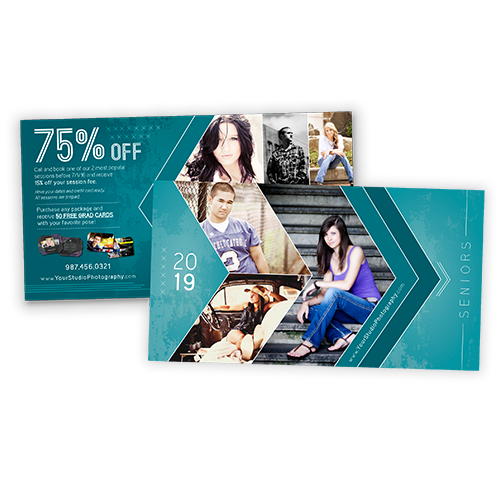 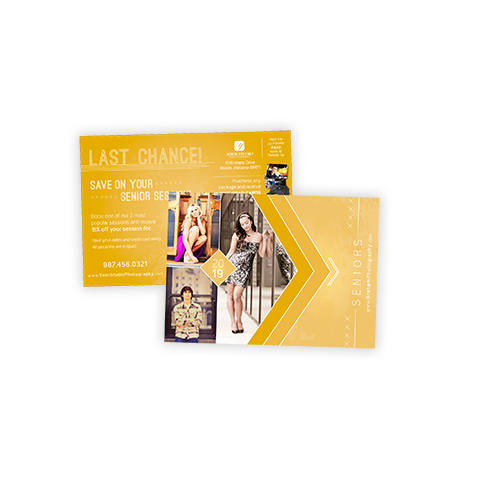 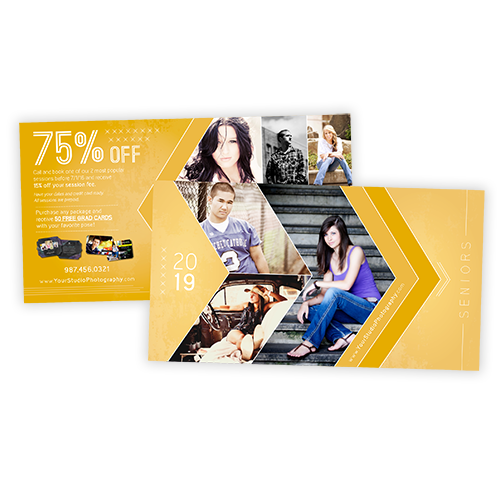 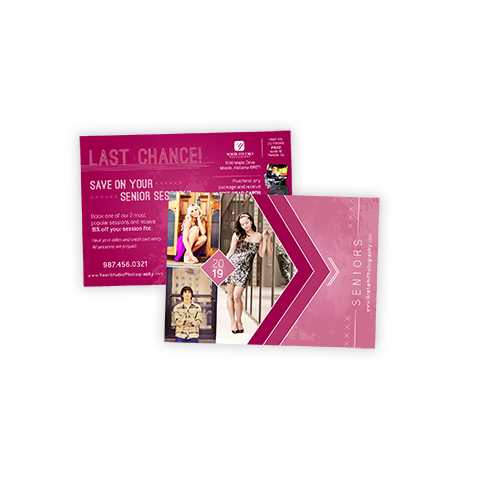 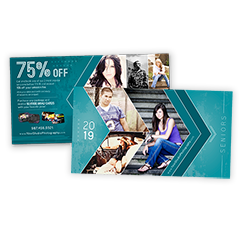 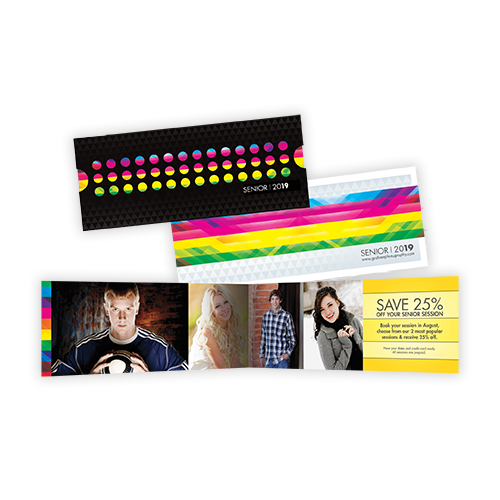 Their Senior Marketing Program gave us a cost-effective way to marry the designs we were already using for our mail outs, with new, very customized marketing pieces. 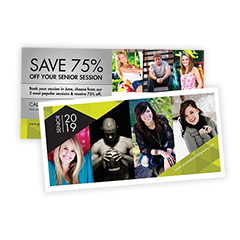 After only two years of using their program, our senior portrait sessions have now steadily increased. 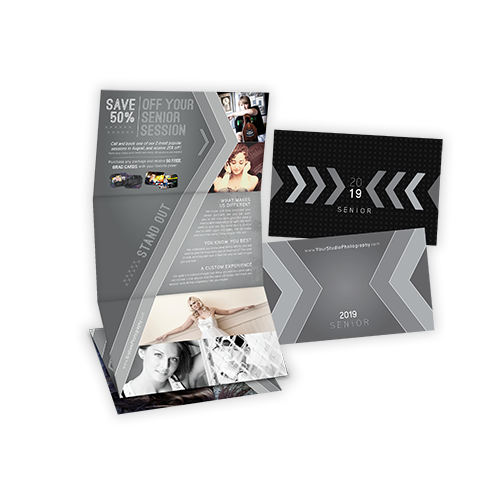 I give full credit to the way the program promotes and enhances our work. 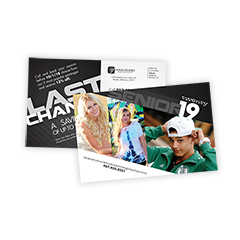 One mother even saved our marketing piece as a reminder to call us when her son, who was then only a junior, became a senior. 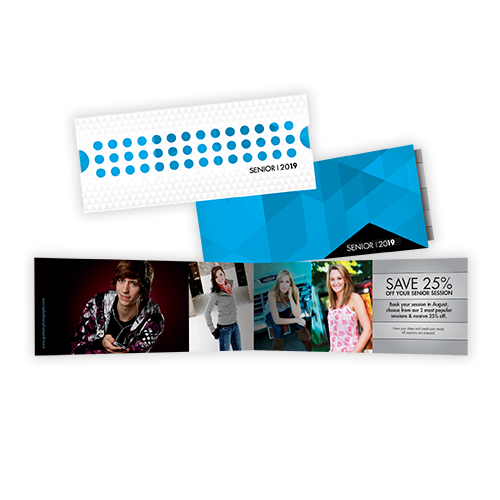 You cannot ask for a better advertising piece." 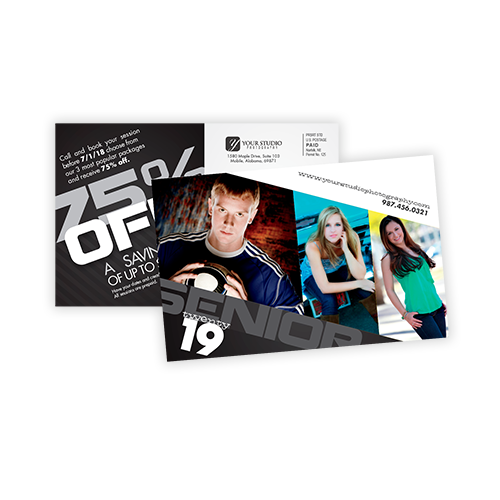 (800) 228.0629 to speak to an Account Representative and place your order today.